A wedding is one of the most unforgettable and important events of one’s life, and you want it to be a perfect event — from the wedding ring and wedding gown to the wedding cake and the wedding decorations. Your ceremony and reception’s theme is often the key to pulling each individual element together to create a magical experience for the bride, groom and all the guests. Choosing flowers as the focus of a wedding is always popular because flowers create a natural, charming and romantic aura for an already beautiful event. But choosing wedding decor that includes flora can have certain drawbacks, such as the cost of favourite flowers that may be out of season, the expense and difficulty of incorporating live plants, wilting and dropping leaves, etc. If any of these factors affect your wedding, you may want to consider incorporating silk or artificial plants into your event. A stately entrance of artificial topiaries at your wedding. Because they are unaffected by seasonal influences, silk flowering trees or artificial flower trees, wreaths, garlands, trellises, topiaries and table arrangements can be the perfect answer to accessorizing your wedding. And forget about the days of tacky-looking faux plants. Silk offerings today have undergone a renaissance; their quality is far superior to the materials used in the past. In fact, you can easily mistake today’s artificial options for the real thing. • Fuchsia or lilac bougainvilleas overflowing on reception tables. • Cherry blossom or rose artificial topiaries lining the aisle for a romantic theme. • Purple wisteria trees surrounding the bridal table with a royal aura. • Lush, flowering hedges that greet guests and create a country ambiance. • Sumptuous arrangements of orchids, lilies or other exotic flowers bedecking the altar. • Lavish garlands of jasmine or magnolias draping the pews. • Quaint grapevine and violet wreaths decorating the church and reception doors. 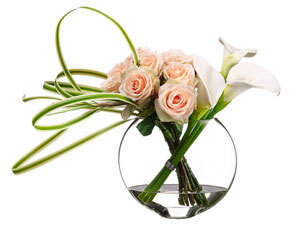 Lush silk arrangements will brighten up any event. 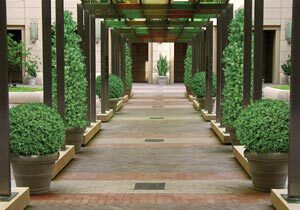 Despite their very real appearance, artificial plants offer the distinct advantage of not wilting or dropping leaves. Thus, you can be assured that your wedding’s setting won’t be spoiled. 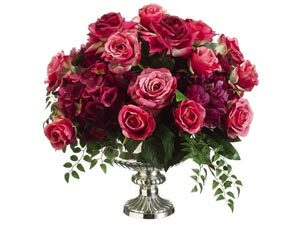 You can also customize flowering plants according to your choice and preferences, thus giving you the opportunity to plan any desired theme. Another bonus? After the wedding festivities have ended, you can use the silk trees or flowers to decorate your home or office interiors. Let your imagination soar as you discuss all the floral options with your florist, no matter what time of the year it is. Today’s sophisticated artificial flowers offer the perfect option to create the wedding of your dreams. The artificial flowers today look amazingly real! I wouldn’t want to ever replace my fresh flowers with faux versions, but I can certainly see the appeal if you have a special need! It would never have occured to me to use silk flowers for a wedding or even a function, despite many companies chosing this as a preferred option to replacing fresh flowers weekly. Good food for thought, thanks! where can i find artificial wine/burgundy calla lilies? We are happy to try and help you locate your wine or burgundy artificial Calla Lilies, but please let us know where you are located. This way we can provide you with options that are close to you. If they can’t help you directly, they will put you on to the best florist to go to in Cape Town. Oh, and you might want to take a look at Mr Price as well. They sometimes have Calla Lilies in a variety of colours. Fresh Peonies, are very rare in South Africa and only available 2-3 weeks of the year, end October until mid November. Please let us know when you would need the white peonies, which month? And whether you require fresh peonies or silk ones?